Aloha again, it’s Geoff here for a second guest blog post! Yes, it’s about chickens again, what self-respecting blog-post wouldn’t be about chickens? So this blog is about being awesome for little or no money, right? Well I am always on the lookout for something that will either make my life easier or cheaper and I like to experiment. Let me throw some light onto a recent chicken-project of mine, the chicken auto-feeder. I’d been contemplating getting or making a chicken feeder that allowed me to stop the wild birds eating the girls’ food, whilst also being easy to use for the little feathered egg-machines. 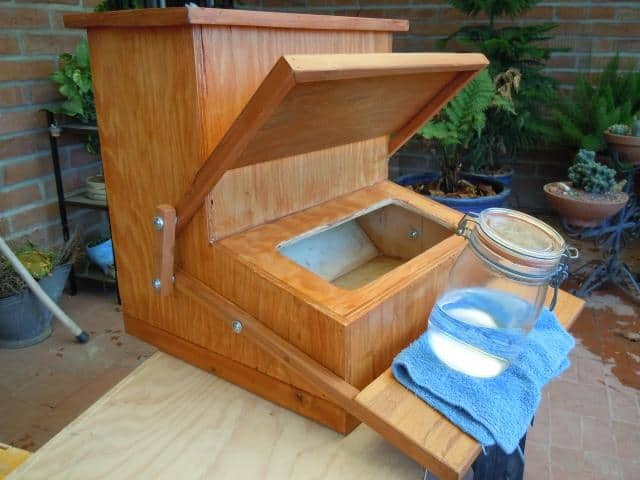 I came across this link one day for a treadle feeder. A treadle feeder is just like the one on the left, and consists of a pedal that the chickens stand on which opens a lid, giving the chickens their secured food. This works on the premise that the chickens are heavier (and smarter) than the wild birds, stopping the wild birds from eating all the chicken food. However, reading through the plans and description of this feeder made me a little queasy…I would need to buy all kinds of equipment and materials to make one! If I wanted to buy one, I found them to be priced around $80 online but with no local distributors! This called for a ‘Plan B’. Take the lid from a large plastic milk container and make a circular hole in it with whatever tools you have at hand. I recommend a soldering iron (one that you don’t particularly use that often) to melt the hole, this way you don’t leave any sharp edges. Make the hole pretty small to begin with, just a little larger than the handle of the drill bit. 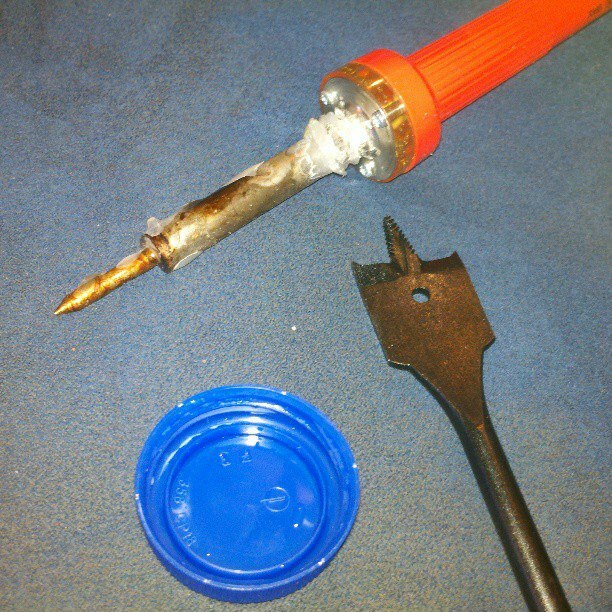 Then, feed the drill bit handle through the hole, leaving the top of the drill bit on the ‘inside’ of the lid. Fill your milk container up with chicken food and carefully screw the lid back on. 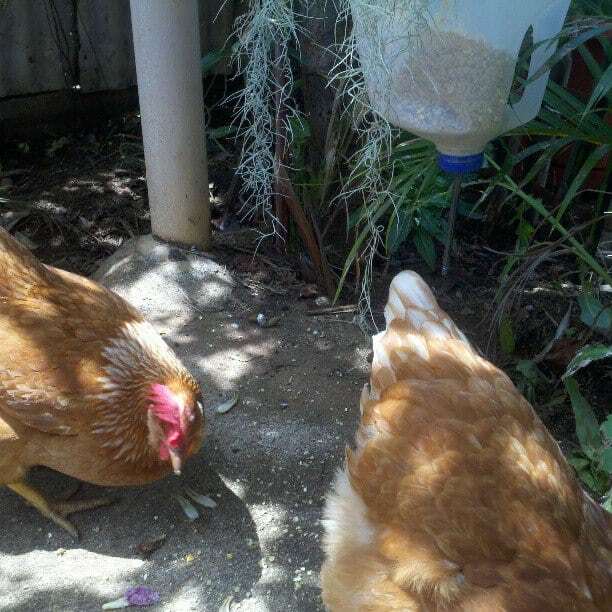 Hang your milk container upside down and voila, you have an auto chicken feeder! Whenever the chickens tap on the handle, food should fall out of the hole! If it doesn’t look like the food will come out (should be a few pieces at a time), simply make the hole a little larger! Click HERE to watch a video of the feeder in action. Total cost…$4. Awesomeness rating…10/10. This is Geoff, signing off…until next time folks! I love this idea! It’s cheap and easy to make and the chickens seem to have picked up how to get their feed in no time at all! Clever chucks!